I finally picked this up after seeing countless recommendations, and I certainly wasn’t disappointed. 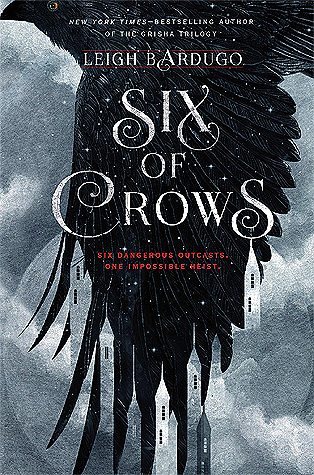 I’d read Bardugo’s Grisha trilogy before and enjoyed it, but this book is in a whole new league (in my opinion, anyway), and now holds a firm position on my all-time favourites list. The suspenseful story and cast of compelling characters had me spellbound, and it was one of those rare books I had real trouble putting down (or really, hitting pause on the audiobook). It also had that original, new, unique flavour I’m always looking for in a fantasy – that feeling that I haven’t read anything quite like it before. I think that's partly because it's basically a heist story set in a fantasy world, which means it’s a high fantasy but without a trek-across-a-continent-and-battle-the-dark-lord storyline, so that makes it feel different and fresh. Important things are still at stake (things that also affect the wider world), but the characters aren’t chosen-ones or royal heirs battling to save humanity, just a group of skilled criminals and fugitives working together to achieve the impossible, keep each other alive, and in some cases, take revenge on those who’ve crossed them.